How to make a Big Mac at home. McDonald’s PR is killing it with these videos. A few weeks ago, McDonalds Canada made a splash with this video about why their products look so much different in the promo shots versus in the restaurant. 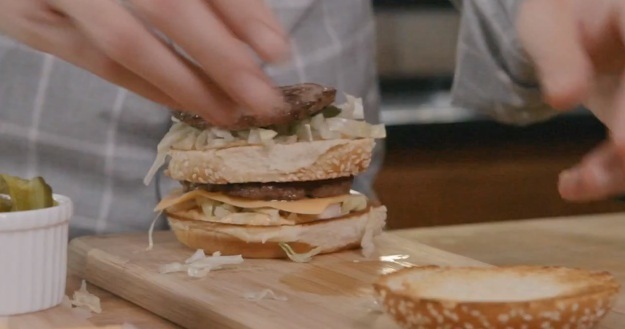 Today, it’s got another great one: how to make a Big Mac at home. The product shot video went into unflinching detail about how they gussy up the burgers to look as enticing as possible in pictures, and this one lays out exactly how to make a Big Mac in your home kitchen, with no shortcuts. The ingredients are common, and Dan Coudreaut, McDonald’s executive chef, lays out exactly how to make the ‘secret sauce’ that it uses in the ‘Mac, along with techniques for chopping ingredients and assembly. The videos are the product of a Q&A site that McDonalds Canada has set up, in which it responds to customer questions about the healthiness of its ingredients, why it microwaves so much stuff and more. There’s really not a lot to it, but it actually works incredibly well as an honest, up front look that helps to demystify the process. Of course, it doesn’t make the product any healthier, and a home-cooked one is likely to be better for you in the long run. But it’s still a pretty cool PR move. Not all that surprised it’s the Canadian arm that’s doing it, honestly. Would love to see a series of videos like this from Taco Bell.